Experience a One-of-a-Kind Elopement at Sherwood Inn! Historic Sherwood Inn’s second Pop-Up Wedding event takes place February 14th, 2019. Historic Sherwood Inn has been host to many of Canada’s A-List weddings since it first opened its doors in 1939. 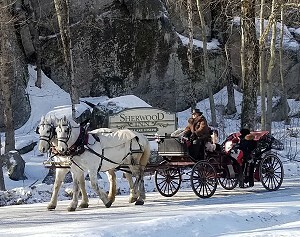 And while the Inn typically books its weddings exclusively (meaning that the entire resort is closed to the public and reserved for a single wedding group), this Valentine’s Day 2019, 4 couples will get to experience the magic of a Sherwood Inn wedding, without the exclusive price tag. Sound too good to be true? Think again. For just $2500++, the Pop-Up Wedding package price makes it possible to have that dream destination wedding within a reasonable budget and a stunning Muskoka setting. Interested in a first-hand account of the event, from the eyes of a Pop-Up married couple? Read Alexandra and Chris Priest’s story on the Sherwood Inn blog for more info. Their picture below was taken at their post-ceremony photography session, included in the package price. - Additional special upgrades available! If you love the idea of an elopement, but want to mark the occasion with more than a trip to City Hall, call Sherwood Inn’s catering manager Christina VanKempen at 1-800-461-4233, ext. 431, or email cvankempen@clublink.ca to reserve your spot!